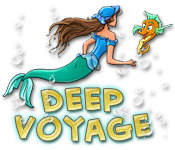 Deep Voyage is rated 4.0 out of 5 by 9. Rated 5 out of 5 by mdavis111111 from Great, relaxing game Some of the levels get challenging, but you just keep trying. Pretty soon you get great at the levels. Wish they made more. 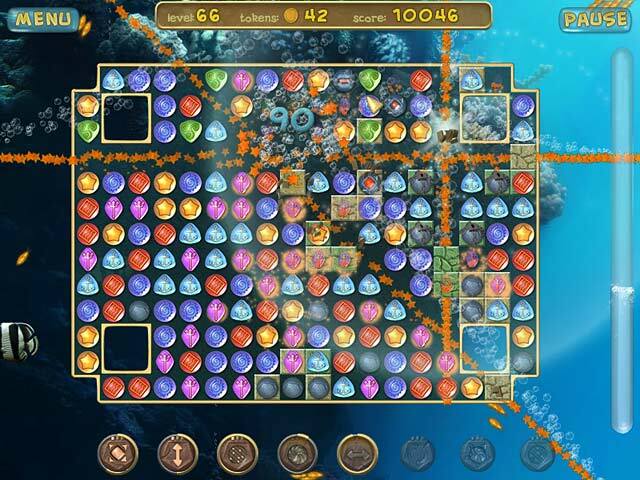 Its a great match 3 game with interesting powerups. I've had this for four years now, and I still come back and play it from time to time. Rated 5 out of 5 by linyoung from Beautiful, Relaxing M3 - with just enough challenge!! I, too, had read the so-so reviews but tried the game anyway. I love Match 3 games, especially with some mini-game diversions! I had been locked into the swap mode only and looking at some of the offerings, hadn't even tried anything else...until Deep Voyage. As has been said, it's a click on groupings mode. Others have pretty well covered the high spots. I just want to mention a few of my particular favorites of this game: Wonderfully satisfactory explosions with power-ups you can select and plenty of others that the game gives you as you go thru the levels. The beauty of this game and its relaxing nature is my all time favorite. You also get to "build" underwater gardens as you go along. There is a timer but it's generous. The game play may not be challenging enough for some of you experts but for my 60-year-old hand/eye coordination, it's just right! And you get to put underwater puzzles together in between blowing up things (smile). Can you tell I love this game??? I honestly can't think of any downsides - other than the timer. Rated 5 out of 5 by louinator from Fun-Addictive-Challenging If you like a challenge this one's for you! Finally something new for M3 games. Some levels are hard, but if you use your bonus choices wisely they can be completed in time. And, yes... I said choices. You choose your bonuses and the level of power to give them. Lots of built-in extras on game board too... extra time, points, bombs, etc... cool. I've completed 80+ levels without having to replay any... some just in the nick of time. Love this game! Rated 5 out of 5 by cwebmarley from A Garden of Delights I really enjoy Match 3 games. I have tried them all, and own quite a few. When a new one comes out, it's try and buy time. I was so disappointed to see the low reviews of this game, but I didn't read them, so I could form my own opinion. I liked this game immediately. After my hour free play was over, I read the reviews, and then bought the game. I have gotten to level 55 without having to play one over. The power-ups are easily used again and again. 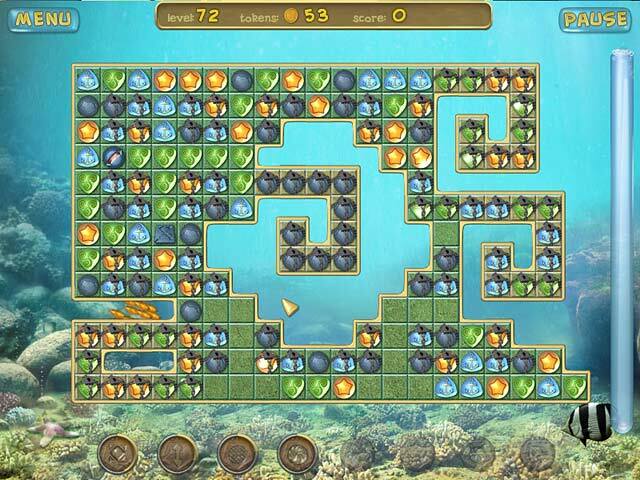 The play involves clicking on a color block of 3 or more, rather than moving tiles to make matches. The 62 year old granny finds this game addicting fun. Rated 3 out of 5 by bessiegirl from Timer is much too hard I've always thought I was pretty good at most match 3 games and usually can get levels completed even with a timer after I figure out what strategy to use. Unfortunately I'm giving this one up after I've tried to get beyond level 72 about 30 times. Just not fun anymore and when a game gets so difficult that trying to beat the timer to move on becomes stressful gameplay its time to bag it.. I think the buzz word here is game"play" which this one isn't anymore. How sad because I was actually enjoying this game. Rated 3 out of 5 by brandyysnapp from Nice Tones I like that each shape has its own musical tone when matched. It is (visually) difficult to tell if a background has been removed. Power-ups MUST be used on certain objects or else they don't clear; I prefer to sometimes play while trying NOT to use power-ups, as a challenge to myself. Tokens must be collected in order to 'pay' for power-ups, but they can be difficult to spot with much movement on the boards. I still prefer my other (which I cannot name) fishy type match 3 games over this one. Rated 3 out of 5 by cajunmeg from Difficult I like this game, but it's very difficult to get past the 50th or so level. The timer completes way before you have enough time to look at the board, stratergize your move, and then make it. Can be frustrating. Rated 2 out of 5 by kathiebee from Too Deep It is a great pity that they never had an untimed version of this. It would have been a great game, but the timer is too quick to get past the advanced levels. 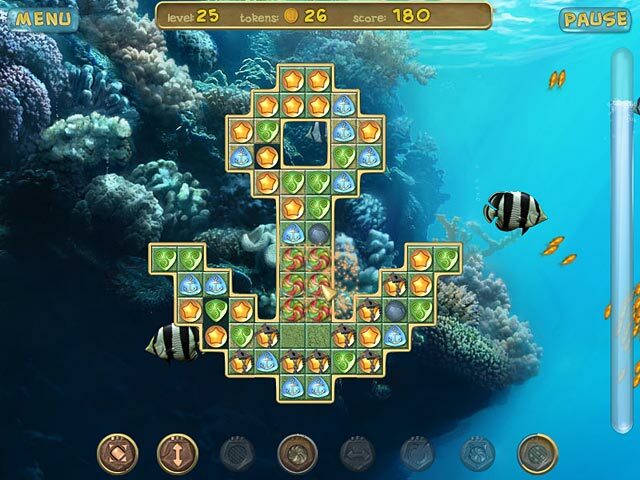 It has a good storyline and good graphics, and I enjoyed making the undersea garden, but I was literally on one level for YEARS on and off before I realised that I would never finish the game, so gave it up. I am willing to persevere if it seems possible, but with this one, no go.